( September 16, 2013, Colombo, Sri Lanka Guardian) Rajapaksa is a 'name' that the British Raj gave to people that did a good job in Negombo/ Seeduwa area, close to Katunayake. Rajapaksa's are born Catholics of Malaccan origin (this explains the strong 'gob looking' Mongoloid phenotype features in all of them). His father's name was Don Alwin Rajapaksa. His son (the President now) is Percy Mahinda. They 'converted' their Religious belief's to gain Political mileage. 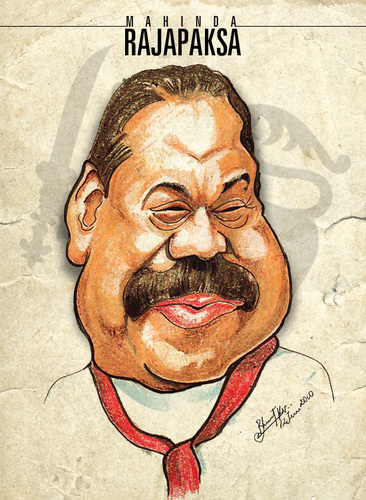 The Rajapaksa family is now one of Sri Lanka's most powerful families in the land. Led by President Mahinda Percy Rajapaksa, all his 'kith and kin' now occupy senior positions in the Sri Lankan state. The Rajapaksa family, originally from Seeduwa/ Negombo later migrated with their Malaccan Catholic ancestors to the villages of Sippukulam and Giruwapattuwa in the southern district of Hampanthottam (now known as Hambantota). Some of the residum of the Malaccan Catholic relatives remain in the Seeduwa/ Negombo area, such as the Lansa Family (no relation of Mario Lansa??!!) of Negombo who are cousins of the Rajapaksa's. Thereafter, Don David Rajapaksa's son Don Mathew Rajapaksa was elected in 1936 to represent Hambantota district in the State Council. Don Alwin Rajapaksa was elected MP for Beliatta and Lakshman Rajapaksa (Don Mathew's son) was elected MP for Hambantota.They yet maintained the subtlety of their staunch Catholic beliefs but appearing to be Buddhists on the outside! The Rajapaksas were represented in the country's legislatures continuously from 1936 till 1977. The family wasn't represented in parliament after the UNP landslide at the 1977 parliamentary election. The Indo-Lanka Accord shed light on the Rajapaksa family to adopt a more headlined" Sinhala Buddhist" policy. Although the Rajapaksas had dominated politics in the Hambantota district, Nationally, politics were dominated by other families (Senanayake's, Wijewardena's and Bandaranaike's - also hypocrites of Christian origin). With the country having faced more than two decades of war (made even worse by the 'Hoodlums of the JVP), the Presidential Candidate Mahinda Rajapaksa opted to take the more radical Sinhala Buddhist extremist path. He was opposed to Ranil Wickramasinghe, who had already created resentment from the Sinhala Buddhist majority and was considered to be 'light veined' and pro- Western. None of these allegation were proved, leaving them only as "tales of the disappointed", although many still believe the contrary! None of these relations had the decency, honour or self respect to decline accepting these 'high offices' if only to squash the obvious embarrassing 'accusations' that followed by the thousands. Numerous other members of the 'extended family' have also been appointed to senior positions of the state. The entire family seems "set for life"!! powers', to override even the Judiciary of the country! Now the majority of the country, completely ignorant of facts and honest information, act like 'lambs to slaughter', under the command and discretion of the Rajapaksa family. To enhance their so called 'power' they have recruited former menials,ex-cattle thieves, illicit alcohol brewers and "father unknown" village thugs, to execute matters of 'law' summarily! Force in the world- that money can buy" !!!! Now, the UDA is alleged to be forcibly acquiring Private and State Property and transferring them on to questionable tri-pâté agreements to their own family members and their 'foot and mouth' soldiers!! Let us all sincerely hope that the "wheels of Karma would turn slowly, but surely"!